Reishi mushrooms are some of the most widely used medicinal mushrooms in the world. Their scientific name is Ganoderma lucidum. In Chinese medicine, reishi mushrooms are known as ling zhi, which means spiritual plant as the Chinese believe the herb is healing for the spirit. Some Asians make good luck charms from the mushrooms in addition to using them as medicine. 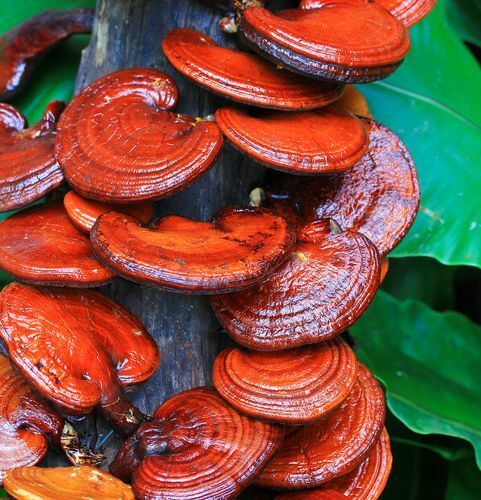 The Latin name Ganoderma means shiny skin, which describes the reddish brown caps of the mushrooms. Reishi mushrooms are kidney-shaped and grow to 8 in (20 cm) or more in diameter. They grow in moist and temperate forest areas of Asia, Europe, South America, and the United States. Reishi mushrooms typically attach themselves to trees, particularly oak and plum trees. Reishi mushrooms have a long history. They have been used in China and Japan for nearly 4,000 years as a health tonic and as folk medicine for liver problems, heart conditions, asthma, cancer, high blood pressure, and arthritis. In Traditional Chinese medicine, reishi mushrooms are classified in a group of herbs known as Fu Zheng, which Chinese herbalists believe are the most powerful herbs for all-around strength, health, and longevity. Other Fu Zheng herbs include Korean ginseng and astragalus. Reishi mushrooms have been rare and expensive for most of their history because they are difficult to cultivate and find in the wild. In the 1980s, a Japanese man named Shigeaki Mori developed an intricate and effective method of cultivating them, which has made them widely available and affordable. Reishi mushrooms have been well researched and tested, mostly in China and Japan. Scientists have isolated several chemicals in them that have pharmacological (medicinal) effects on the body. Reishi mushrooms contain compounds called polysaccharides, which have been shown to help the body fight cancerous tumors and also stimulate the immune system to combat infections and viruses. In studies on mice, reishi mushrooms have shown very strong results against cancerous tumors. One Japanese study suggests that reishi mushrooms may serve as a chemopreventive against colon cancer. Other substances called triterpenes have been found in reishi mushrooms and shown to lower blood pressure and improve circulation. Reishi mushrooms also contain sterols, which may influence the hormonal system; and natural antihistamines, which reduce allergic reactions and inflammation in the body. More recently, reishi mushrooms have been identified as a source of antioxidants, which are enzymes or other organic compounds that counteract the damaging effects of oxidation on human tissue. In Asia, numerous clinical studies with humans have documented reishi mushrooms’ healing properties. They have shown significant results in treating hepatitis, chronic bronchitis, asthma, and heart disease. Reishi mushrooms have also been shown to lower blood pressure, lower cholesterol, increase white blood cell count, reduce allergic reactions, and have a calming effect on the central nervous system when given to humans in observed studies. Reishi mushrooms are recommended as a general tonic for health, energy, and longevity. They are prescribed for diseases including coronary heart disease, cancer, and AIDS; and for such chronic infections as bronchitis, hepatitis, and mononucleosis. Reishi mushrooms are also used to treat high blood pressure, asthma, nervous disorders, chronic fatigue syndrome, and arthritis. In China, they are used by mountain climbers to combat altitude sickness and are given as an antidote to patients who have eaten poisonous mushrooms. Reishi mushrooms are available dried and as powder, tinctures, tablets, capsules, and syrup. Reishi products can be found in health food stores, herb stores, and Chinese markets. The recommended daily dosage varies with conditions. For severe conditions such as cancer, heart disease, and chronic infections, 9–15 g daily in three equally divided dosages is recommended. For a general health tonic and for less severe conditions of asthma, high blood pressure, infections, and nervous disorders, 2–6 g can be taken daily, in three equal portions. Tea can be made from dried mushrooms or powder, and the recommended ratio is 2–5 g of dried mushroom per liter of water. The mixture should be simmered on low heat for more than two hours, to extract all the active ingredients. The tea can be drunk twice daily. For severe health conditions or for an antidote to mushroom poisoning, some herbalists recommend a strong reishi tea mixture, with up to 20 g of dried mushrooms per liter of water. People with allergies to molds or fungi should use care with reishi mushrooms, although allergic reactions to them are generally rare. Consumers should search for reishi products that are made by reputable manufacturers. Some dried mushrooms have been sold as Reishi mushrooms when they were actually similar mushrooms by the scientific names of Ganoderma oregonense and Ganoderma tsugae. These resemble reishi mushrooms in appearance and taste and are in the same genus, but according to herbalists have different and less-effective healing properties. In clinical studies, reishi mushrooms have been shown to be nontoxic in high doses, and severe side effects have not been observed. Mild side effects may include stomach upset, dry mouth, diarrhea, and skin rash, and generally disappear after several days. Side effects can be alleviated by stopping use, or in the case of stomach upset and diarrhea, taking the supplement with meals. For treating severe conditions, large doses of vitamin C, from 1–10 g per day, may be prescribed in conjunction with reishi mushrooms. Prescribing vitamin C has been observed to reduce the side effect of diarrhea that may occur with patients who are given large doses of reishi mushrooms. Reishi mushrooms have been reported to intensify the effects of blood-thinning (anticoagulant) drugs, including aspirin, dalteparin sodium, enoxaparin sodium, and warfarin. Patients taking these medications should not use tonics or other preparations containing reishi mushrooms without consulting their physicians.